Last night the Met Office won the Social Buzz Award for Best Public Sector Social Media Strategy for ‘Sharing the weather when it matters’. The award is in recognition of the work of the Met Office has been doing to use social media to engage in online conversations about weather and climate, and to share important messages, such as impending severe weather forecasts and warnings, when it matters. The Met Office has built a community of over 180,000 followers and fans across Facebook, YouTube, Twitter and this news blog, sharing and engaging in conversations as varied as how severe weather may affect the UK, Saharan dust reaching the UK, and the Jet Stream. 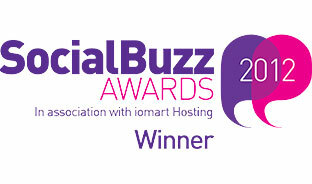 More information on the awards and a full list of the winners can be found on the Social Buzz Awards website. This award follows our Computer Weekly best use of social media award in 2011 and being recognised as the 9th most social brand in Social Brands 100 earlier this year, putting us firmly at the forefront of social media within the public sector. This entry was posted in Met Office in the Media and tagged blog, Facebook, Met Office, social buzz awards, Social media, Twitter, YouTube. Bookmark the permalink. CONGRATULATIONS!!!! I’m never far from the Met Office website and tweets. A Well-deserved award. Well done, well deserved !